1/14/2005 1:30:26 PM Mountain gc:: Amen wlj, More to learn. I need to at least balance my smiles and frowns. 1/14/2005 1:15:19 PM Mountain wlj:: GC, with bradley dates are more important than direction. also work with planets on the diff gann wheels. note where planets are at and where sp price went that day. my coments a few hrs back " was looking for mars and pluto ". the first time sp runs to the price you thought it would you will not be able to get the smile off your face.....the road to success is always under construction. 1/14/2005 1:12:58 PM Mountain gc:: If I am correct, that completed the clamshell. 1/14/2005 1:09:41 PM Mountain gc:: I am working hard in order to become proficient. I still make foolish mistakes. I must overcome them. Laryy Pesavento's rules are helping alot. Fear, greed, and hope are my nemisis. I am getting better though. One system exited ok. Three to go. 1/14/2005 12:59:11 PM Mountain g9:: and another .50.......when I get to +4 or better I quit. Have a great weekend folks. 1/14/2005 12:55:46 PM Mountain g9:: ha.....me work? LOL I'm up 3.75 and watching. Y'all need to keep in mind when I get my .50 or .75 I'm trading 15-25 minis at a time. 1/14/2005 12:44:03 PM Mountain gc:: Sorry, I meant to ask the others. I am currently in four different systems that are short. Some scalp, some trend. 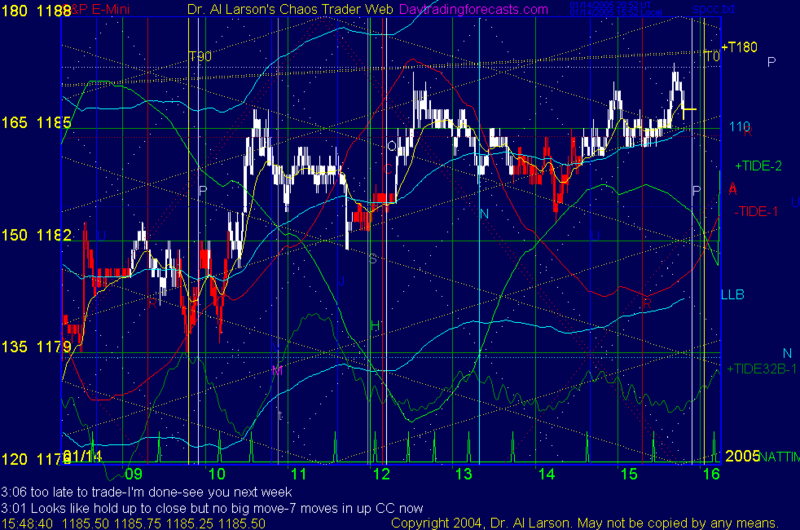 1/14/2005 12:37:11 PM Mountain g9:: I'm a pure daytrader. Since I trade for 1-3pts at a time the Bradley is useless to me. I do what Miss Market tells me to do. 1/14/2005 12:16:09 PM Mountain gc:: G9, when does the Bradley breakdown? 1/14/2005 12:03:22 PM Mountain gc:: I understand g9, I trade two other systems besides Dr. Al's. I am in the big middle of research. I am building several automated trading systems and researching everything from astro to ZigZag. It takes alot of time to sift the material while gaining trading experience. In the end I know I will be successful, but it may take longer than I want it too. I need a lttle boost in my trading account in order to buy more of Dr. Al's education. In the meantime, I will have to read and hand with you guys and my friends in a HOTcomm room. 1/14/2005 11:55:10 AM Mountain g9:: gc.....Dr. Al knows his stuff and does great things here. I just trade a different system. Al doesn't really want me to give my take because it could screw up what he's doing. I respect that 100%. 1/14/2005 11:51:45 AM Mountain gc:: I could use some good news if you have any g9 or Al. It would be a good end to a poor week for me. 1/14/2005 11:15:19 AM Mountain wlj:: MJS,when you gave out the bradley dates a few min ago thought you might nave been to amanita site. that is std bradley. xxman, al's pal sells a short term bradley. hits a lot of the turns in the market. 1/14/2005 11:00:47 AM Mountain wlj:: g9, you get much snow down there ? 1/14/2005 11:00:06 AM Mountain mjs:: About other ideas and systems: I found a web comment from someone who started with the Delta system and lost money. A year latter he posted a self critism. Seems he concluded his error was to out guess a good trading method and ended up with poor results because sometimes he followed it and sometimes he didn't and like many had the unique ability to chose the bad trades from the good trades so executed bad trades and passed good ones. I've done that myself many times. Education isn't cheap. 1/14/2005 10:55:09 AM Mountain mjs:: try this link http://www.amanita.at/e/faq/e-bradley.htm it is an European Astrologer and Market forcaster. 1/14/2005 10:51:46 AM Mountain gc:: Where is the best source to find the Bradley in the form of software or a calculation? 1/14/2005 10:51:25 AM Mountain mjs:: sometimes it is like splitting FROG HAIR. That isn't any easier either. 1/14/2005 10:47:35 AM Mountain gc:: It is frustrating to be fundamentally correct on the market direction, but then, miss moves on timing. 1/14/2005 10:44:58 AM Mountain mjs:: Thanks wlj. But it won't come up for me on my computer for some reason I just get that x in the upper left corner. 1/14/2005 10:36:53 AM Mountain mjs:: I was reading some stuff on Livermore's trading. Seems he got a wire each morning on the action in the British Exchanges and used that to do his day trading. Wonder if anyone has looked at the moon tides that way or tried to make similiar correlations of action in Europe to our trading. I know the Japaneese exchanges often times look a lot like ours just delayed timewise. 1/14/2005 9:57:19 AM Mountain Patents:: Now that it is a few days past the New Moon Turning Point highlighted in the newsletter, what is the expected direction coming out of this turning point? 1/14/2005 9:55:43 AM Mountain wlj:: GC, maybe m / v 0 deg apart all week affected things. i know it did for what i watch. 1/14/2005 9:30:33 AM Mountain gc:: Seems like it has been difficult to pick the correct tide this week. Inversions also. If it plays out like most of the week, the tide will invert here and help cure my woes. 1/14/2005 9:13:00 AM Mountain mjs:: The newsboys say rally due to good eco news (producer prices down) but there isn't follow through. I've noticed this before when our tides say one thing and news says another there is a blip of rationalism over emotionalism (so I call it) then the lower brain stem takes over so there is a time shift. 1/14/2005 9:02:26 AM Mountain g9:: hey y'all.......how's she trading? 1/14/2005 8:22:34 AM Mountain mjs:: That Tidenew is very interesting on the AUX page. 1/14/2005 8:12:00 AM Mountain mjs:: Tide 32 has a very nice match so far after the open. 1/14/2005 8:10:03 AM Mountain mjs:: Looks like still in the chop of the last few days.